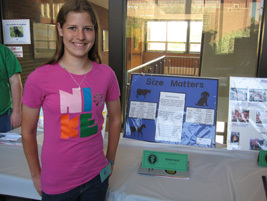 Each year the Purdue University School of Veterinary Medicine invites 9th-12th grade 4-Hers exhibiting at the Indiana State Fair in Veterinary Sciences to participate in Purdue Veterinary Medicine's Open House. 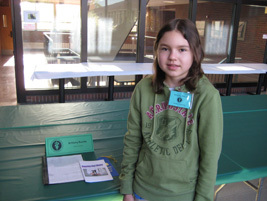 4-Hers exhibit and discuss their projects with Open House visitors, members of the School of Veterinary Medicine Admissions committee, faculty, staff, and students. 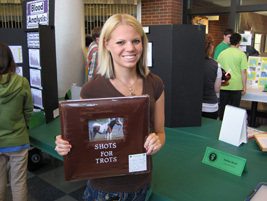 The exhibition is followed by a student panel where 4-Hers can ask current veterinary students about their experiences. Participants are given information on careers as veterinary technicians/ technologists and doctors of veterinary medicine. 4-Hers are then presented a certificate of participation. 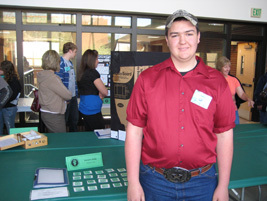 For more information, please contact your 4-H leader. 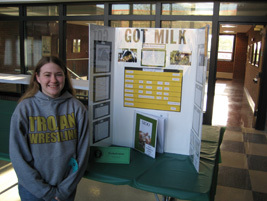 "I decided to focus my project on dairy reproduction because I have always loved working with and learning about large animals. I started getting more involved which has given me an advantage working at Ark of the Dunes Animal Hospital." With this current information, I am trying to receive a grant to continue my research on the Haemonchus worm and its mutations." "In order to keep pets healthy, a person must have a good understanding of the diseases they contract. Therefore, I decided to create a booklet abour various diseases that can harm dogs." 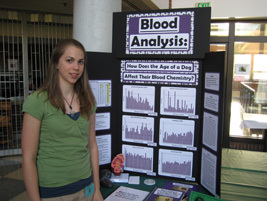 "Blood chemistry has always fascinated me and through my project I tested when puppies ALP, ALT, Blood Urea Nitrogen, Creatinine, Glucose, and Total Protein levels were in the normal range, which I concluded was at the age of 24 weeks." 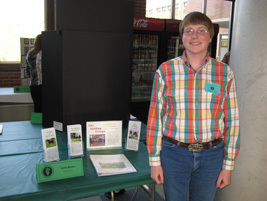 "My name is Keith Brown and I did my project on gelding horses. It is an important decision to geld. I designed a series of brochures to help with the process of deciding and what to do when you get your horse gelded." "I obtained the ideas for both these posters while shadowing a local veterarian. Now I shadow all the time! I love being around this field because I find it so intriguing." 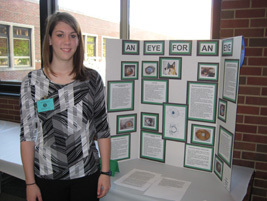 "One of my dogs was diagnosed with ophthalmic problems and so I decided to research the different diseases of the eye. I researched diseases found in cats, dogs, and horses." 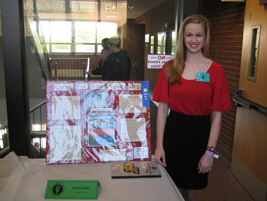 "My name is Sarah Fisher, a sophomore from Salem. 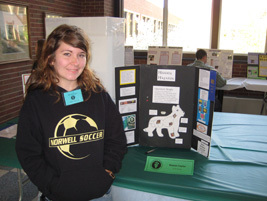 I researched careers that involve a degree in animal sciences or veterinary medicine. Many people are confused by the difference between a veterinary technician and a veterinarian. 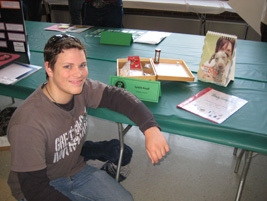 I learned just how much nutritionists do and have to know about animals to keep their food safe and clean. 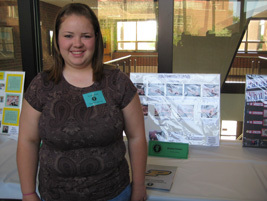 I learned a lot about different careers available that involve veterinary medicine." 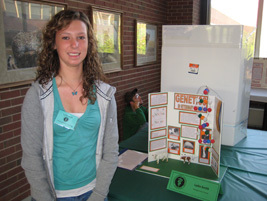 "Genetics are very important to veterinary science because genetics help us understand what traits will be passed on to animals' offspring. Diseases such as TH (Tibial Hemimelia) have become preventable because of better knowledge of genetics." "Many people don't realize how harmful many household items can be. I did this project to raise awareness and hopefully prevent some injuries." "My name is Brad Abplanalp originally from Brownsburg, IN. I am now a freshman at Purdue University majoring in Biology and Pre-Vet with a wildlife minor. I am so grateful that I was able to participate in this phenomenal opportunity for one last time. My last 4-H Vet Science project explored why Scottish Terriers are most at risk for developing canine bladder cancer TCC masses. This Star Trek related theme came about through a job shadow with Dr. Knapp in Small Animal Oncology at PUSVM during my senior year of high school." 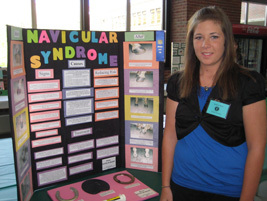 "My poster displays the signs, causes, treatment, and ways to reduce the risk of navicular. I chose this because my horse has navicular." "Animals are classified in a variety of ways. This helps scientists to study them. I have made up a matching game to help people learn them." "My name is Justin Knoll and I'm a 10 year 4-Her. My project is called Veterinary Knowledge Pursuit (Versions 1 and 2). It is a game that is based around knowledge that should be known by those in the vet field. Version 1 focuses on general knowledge while version 2 focuses on parasites in dogs and cats. 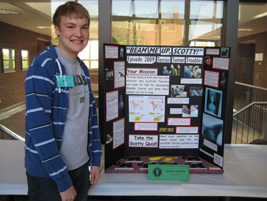 I did this project to make a fun and involved learning tool to be used by everyone." 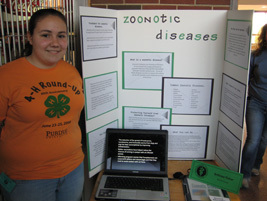 "My name is Brittnee Fisher and my project is on zoonotic diseases. A zoonotic disease is one that can be transmitted between animals and humans. 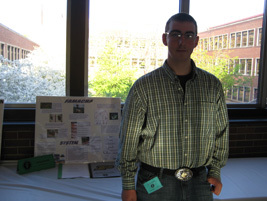 I chose this project not only to educate myself but to show others the dangers of zoonotic diseases, how to protect themselves, and what to do if they were to contract one of these diseases." 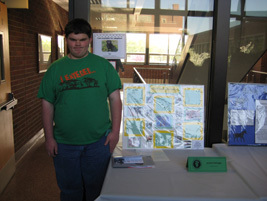 "My project shows comparison of age at puberty and length of gestation for different types of animals. It shows how, based on the size of the animal, you can figure out the length of gestation. I included many different mammals that a vet might see." "My project shows how to A.I. a cow. The poster also shows what equipment is used and what each piece is used for. This topic interested me because my family uses A.I. to breed many of our cows." 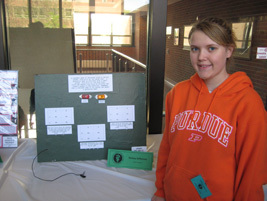 "My project for Vet Science is a matching game. The player has to match the parasite up with what it does and causes. 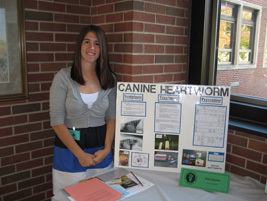 I was fascinated with the parasite activity and wanted to help others understand the parasites that may infect their pets." "Punnet squares help in detrmining certain traits an offspring will have. When a dominant trait is present there will be a greater chance of the offspring having that trait." 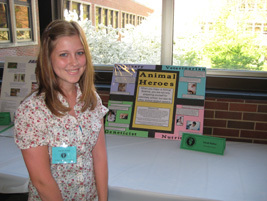 My project explains and describes jobs that involve veterinary science. 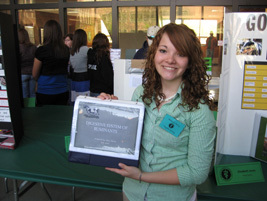 I did the project to intrigue the public and to push them into a veterinary career. Fleas are a very harmful parasite, more than people realize. There are many preventable diseases that the public doesn't know about. 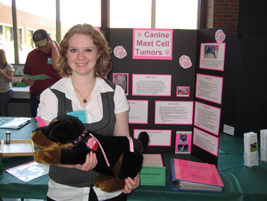 "My project is on canine mast cell tumors. These mast cells are found naturally in the body, however, a large amount of them can cause problems. These tumors can be very serious and can spread throughout the body. I personally picked this project because I work with a vet whose dog was an amputee due to a Grade II mast cell tumor when it was 13 weeks. I was really interested in this project on a personal level." 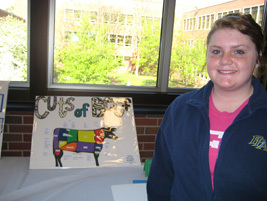 "Describe the functions and parts of a ruminant's stomachs. Also talk about bloating and how to prevent it." "My sister's dog died from canine lymphoma last June and that gave me the idea to learn a little more about this kind of cancer." "I'm Christa Finley, a senior from Plymouth. I did a study on canine geriatrics, covering arthritis pain managment, hospice care, and euthanasia. My dogs (13 yrs) originally got me interested in the topic and I was grateful for the knowledge I had gained when he passed away a few weeks ago. I hope I can help ease others' pain as well." "As a horse owner I think it's very impirtant for people to be educated on vaccines their horses need." 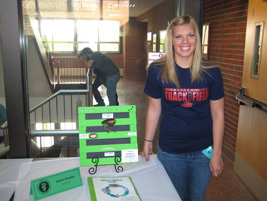 My name is Katie Barnett, sophomore, from South Whitley. 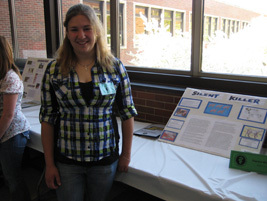 I did my poster on embryo transfer for sheep. I am fascinated on the transfer of embryos from ewe to surrogate mother. I plan to be an embryologist for sheep and cattle. "My name is Rachel Schmitt and my project shows the different qualities and cuts of beef based on their demand and popularity based on today's market industry. 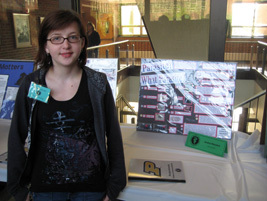 I chose this project because I see it as a tool to help myself and others."